Welcome to JillMorrow.net | Newport, a Novel | Why Newport, anyway? Home » Blog » Why Newport, anyway? I grew up in Annapolis, MD. Maybe that statement feels like a non sequitur following the title of this post, but bear with me. …except that my characters had other ideas. I had just begun to write my new manuscript (set in 1910) when the dreamy protagonist(female) bowed out, introducing another character in her stead. And what a character! Adrian de la Noye came with very definite ideas about what he wanted to say, and most of them bore very little resemblance to what I’d already started to write. I figured out quickly that 1910 was out: the book would take place in 1921. It was also clear that Adrian’s story was far more tangled than the placid one I’d originally had in mind. I was a little slower to catch on that Annapolis would not be the stage. Apparently I was frustratingly slow, because after a week or so of trying to squeeze Adrian’s story into my chosen setting, I woke up one morning with the word “Newport” etched on my mind. I had never been to Newport, but I’ll grab any excuse to travel somewhere. And so, one rainy week in March, my daughters and I took off on an adventure to Newport, Rhode Island. And here’s what I found: a picturesque historic district dotted with colonial-era buildings, a beautiful waterfront, and the home of the U.S. Naval War College. In addition I got glittering gilded-age mansions, an oceanfront view. and a city with a long history of being a playground for the wealthy. It turned out my initial imagery for my new story had been correct. I just didn’t have enough information in my personal databank to know that my subconscious was showing me Newport, not Annapolis. Adrian was satisfied. Set loose in the location of his choice, his story began to unreel. My own Newport adventure continues to be a wonderful, surprising trip. 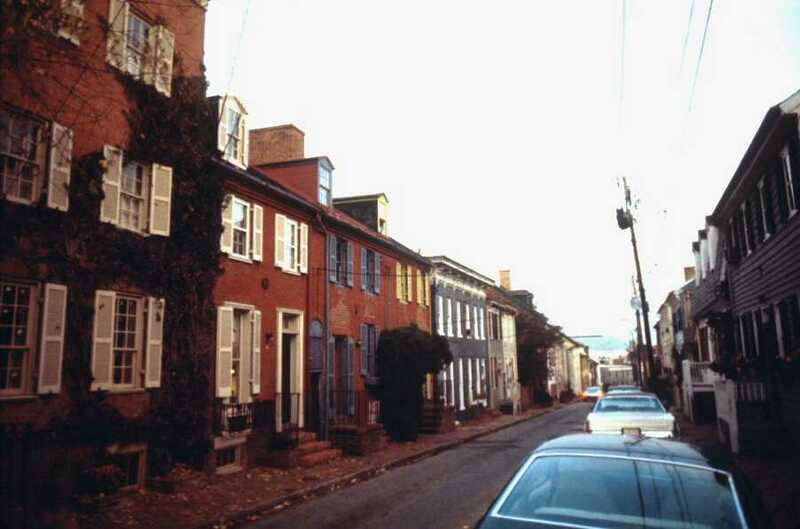 With Annapolis in my blood, Newport has always felt familiar, and it’s a joy learning more about this fascinating place that has lent its texture to my novel. I am not a travel writer, nor do I plan to discuss Newport’s history at length. (For those aspects you’ll need to go here or here.) I like the quirky undercurrents of places, the people and stories that might not make every guide or history book. Those are the Newport stories I hope to share here on occasion. I still hope there’s an Annapolis story in my future. But for now, I’m happy to spend time with my hometown’s kissing cousin, Newport, Rhode Island. I think you made the right choice! Although in ask fairness I’ve never been to Annapolis. Newport is just so rich in possibilities. I’m glad to have found a “kindred spirit” and look forward to your release! Thank you, Alyssa. You would like Annapolis, I think! And I am loving Newport. Congrats on your new Newport release as well! When you can’t be in a particular location, isn’t it nice to know that you can travel there via the pages of a book? I loved your first two books and your blogs so I know I’ll love Newport! I can’t wait for July! WOW! I’ve got my bags packed, the car filled with gas, and the GPS plugged in. I am traveling to Newport with you to share an adventure. Can’t wait to begin the trip. Thank you, Marge! I’m looking forward to July, too. And I’m glad you like the blog. Thank you for reading!